As usual, the pancete did not survive long at all once it was made. I didn't think to take a picture until after it was gone, so if you're really curious about it google it and you'll most likely come up with what it looked like. It's basically rice noodles, chicken, shrimp, and soy sauce. There are more seasonings and veggies added, but all of the recipes in my experience have those base ingredients. The meat might be different depending on the country/region of origin, but the taste and texture is the same. After eating I went upstairs to try and play some video games with my brother. That never happened because without XBox live you cannot play local multiplayer on Black Ops 3. Uh, what? Looks like I'm no longer picking up any next gen consoles. First Halo 5 doesn't allow local multiplayer, then Black Ops 3 requires a completely unnecessary think for, like I said, local multiplayer. Split screen. One XBox. No internet required. Grrrrrrr. One of my favorite things to do with him is play Nazi Zombies, and now I can't do that on the next gen games. After that failure I went back downstairs and made some soap. 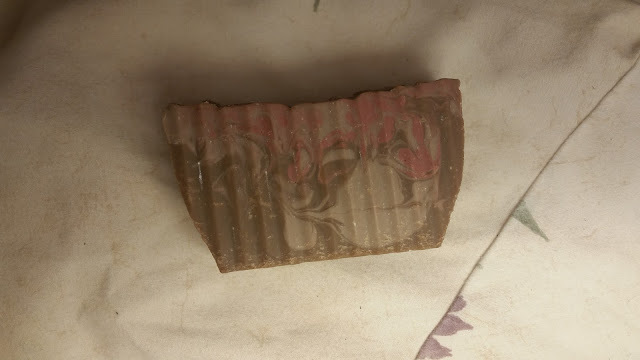 This time my soap was a pine and whatever-extra-stuff-I-wanted-to-use mixture. It's not quite pure pine/fir, but you can't really pick out any other notes besides generic winter/forest. I'll take it. This was another batch that was slow to trace, although it was not quite as slow as my previous batch. I liked that, as the batter did not move around in the mold when I took it over to the oven and spill everywhere. After that I went upstairs for a nap. I woke up to Mom informing me that my passport had finally arrived here. I know I mentioned that my passport was done, but by that I meant it was at the government facility ready to be sent off to me. Today it is finally in my hands and I can get in touch with transportation and get my ticket! Cue excited squeal/dance! After that I played some Diablo 3 with Dad. I didn't end up playing for too long because Dad mentioned that he wanted more soap and more vanilla, and I mentioned that I needed more base oils like olive and coconut. So Mom and I went to the grocery store and picked up some of that stuff. I also picked up some canola oil as I'm curious about how it'll perform in soap. We got back and watched some sappy romance movie Dad had on while I worked on my email that I had to send to transportation. I also got caught up in some site surfing and blog reading. What can I say, I've really gotten back into the bloggy scene. Both reading and posting. After the movie was over I checked the mail for some presents we got for family and then headed upstairs. I'm probably going to watch some old animated series and then head off to bed. Avatar: The Last Airbender anyone? Have you ever had rice noodles? Any idea when you'll be leaving now? I tried to play Skylanders yesterday but just couldn't get into it. I'm going to try again as soon as I finish my internet rounds. I see Casey is downloading some game called Tera. Never heard of that one.